Adina Coogee’s new look is bright and modern yet features warm and soothing colour tones. 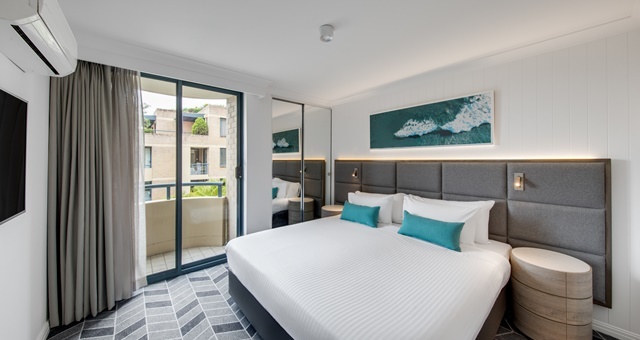 A major, multi-million dollar renovation project has been completed at the Adina Apartment Hotel Coogee, with managing firm TFE Hotels pulling the curtains back to reveal the finished product. Decked out in a grey, caramel, teal and navy colour palette, the range of 86 self-contained studio, one and two-bedroom apartments now feature a much brighter, energetic look and feel, aimed at delivering guests an example of beachside living in Sydney’s eastern suburbs. The new interior design came as a collaboration between TFE Hotels’ in-house design team and design brand D’Cruz, intended to evoke feelings of a relaxed lifestyle with the city still only a few kilometres away. All apartments feature new kitchen and laundry facilities along with free wi-fi connectivity. Guests can also access a modernised gym and indoor swimming pool along with inner courtyard area. “The refresh of one of our most popular Adina Apartment Hotels in New South Wales coupled with its unbeatable location near the beach provides guests with the ideal place to base themselves when visiting Sydney, hold meetings, or even have a staycation,” said TFE Hotels’ Chairman Allan Vidor. Adina Apartment Hotel Coogee is located around 200 metres from Coogee Beach and a number of high-quality restaurants. The suburb is also a link to a number of picturesque coastal walks to Bondi and Maroubra.